After the military coup in 1976, dozens of Argentines fled to Caracas, found jobs, became teachers, completed their studies and even started a newspaper. You must have noticed the proliferation of cute Caribbean accents; they are really the sound of the desperate. In Buenos Aires, and now also in the larger provincial cities, the song-like speech is mostly Venezuelan accents. According to United Nations estimates published in June this year, 2.3 million Venezuelans have now decided the state of the nation was a disaster and left their country. The drain began in times and politics of the late Hugo Chávez, before the rule of President Nicolás Maduro, aged 55. Much of the 20th century saw the biggest migrations in history, caused by wars, persecution, changing borders and economic hardship. Now, in the 21st, we know that massive migrations precipitated by localised crises happen just about everywhere in the world, and in every decade too. But mass movements of people in South America have never been as impressive – unless you feel strongly about Cuba since 1959 – as have been those of African or Indian or Chinese peoples following famine, revolutions or wars. Joining that list, along come Venezuelans who, in recent years, must be showing one of the most impressive waves of departures ever in this region. The sight on television of columns of people, dozens, hundreds, walking alone or in small clusters to ward off thieves, in every available form of transport, along dusty roads and over rocky hills in Colombia, down through Ecuador to Peru, some with the aim of reaching Argentina, is distressing as much as worrying, in face of something taking place right here. It is not yet called a human calamity, the phrase probably avoided for political reasons. According to United Nations figures sourced in Lima by the Office of International Migrations, there are 400,000 Venezuelans in Peru. But that is just a smaller part of the initially quoted 2.3 million. Last February, figures that were published showed that 925,000 Venezuelans had left between 2015 and 2017, mainly to Colombia. The same research showed that 1,622,000 had decided to leave their Venezuelan homes over the last 10 years, and out of that sum 1,552,407 moved to 15 countries. 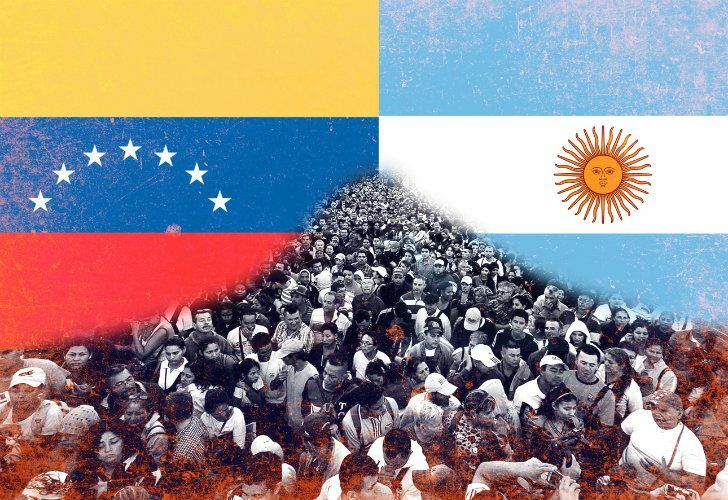 The report compilers found that 885,991 Venezuelans had spread out in South America and the rest in three European countries. The principal destinations chosen are Colombia – where outbreaks of racism, rejection and diverse prejudices have been expressed – followed by Ecuador and, further south, in Peru and Brazil. The United States and Spain have also recorded high numbers of entry applications. Argentina is further down the list but climbing. Venezuelans had previously been allowed to enter Peru without passports, but the government in Lima introduced the requirement of documents as from August 27. The passport decision sent people rushing to the Ecuadorean and Colombian borders to meet families who could beat the deadline and get into Peru without documents. The date coincided also with the departure of a first chartered flight on a Conviasa plane, from Lima to Caracas, carrying 100 people who had chosen to return to hardship at home rather than suffer the ignominies of expatriation and the cruel search for work in other countries. However, 100 returning nationals do not carry much weight in face of the high figures for people leaving. The assisted flight home may have been a decision by President Maduro, who was made aware that the migrants were in their vast majority young people looking for food and medicine and work. Put together they constituted a considerable part of the next generation of people who would be the country’s backbone. Writer Racioppi also looked at the advent of musicians in public spaces, on trains and on the underground, where any variety of themes and styles are to be heard. In this case attention was on a group of 80 musicians who have clubbed together to form Latin Vox Machine, performing anything from Bach to Mozart to Piazzolla. For one 19-year-old violinist it had taken a week travelling overland in part through Brazil to get to the Argentine border. For many of the young people this is their first travel out of their country. The Buenos Aires version of LVM is an offspring of one that has been going in Venezuela for 40 years, directed by South Korean, Jooyong Ahn. Their presentation card is a photograph of all 80 on the steps of the School of Law. It is good that Argentina is accepting exiled or migrant Venezuelans. It’s something like a belated thanks for a distant favour. After the military coup in 1976, dozens of Argentines fled to Caracas, found jobs, became teachers, completed their studies and even started a newspaper. Books by many Latin Americans were published, scholarships were granted and there were jobs for all. One of those Argentine exiles, a designer, even planned the slogans for the election campaign of a president of Venezuela.